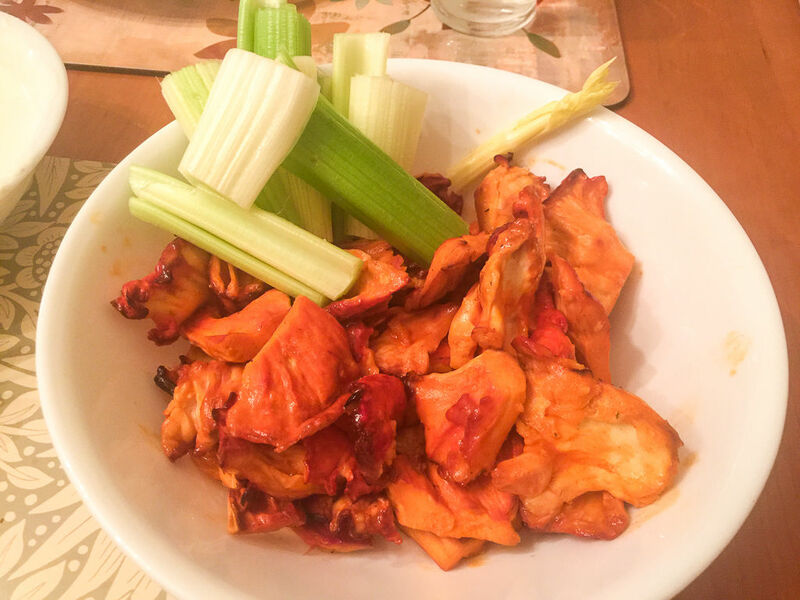 I had recently found some nice young and fresh chicken of the woods and was looking for an appetizer recipe rather then the more traditional main courses and came across this Buffalo chicken of the woods recipe. After trying it I had to share. I have adapted the original recipe by The Foraged Foodie. Chicken of the woods (Laetiporus sulphureus or Laetiporus cincinnatus) has a great texture that is very similar to cooked chicken. You need young chicken of the woods for the best texture when cooking. If it is too old it either becomes very hard and woody or worse, mealy. Finding young and fresh chicken of the woods is a lot rarer than you think. If you do find a nice fruiting and have some spare it is easy to store. Clean the shelfs and cut the really woody parts off then vacuum pack if you can and freeze. The blue cheese sauce and celery sticks are optional but why not go all with this fabulous appetizer? No one will complain if you use bottle ranch or blue cheese dressing. Wipe a baking sheet with high temperature oil, Place the chicken of the woods pieces on the baking sheet and bake for 15 to 20 minutes. Near the end of the baking time melt the butter in a sauce pan on medium heat and add the garlic and heat. Don't let the garlic brown. After a minute or two when the garlic is fragrant add the hot sauce and stir to incorporate. Check the chicken of the woods it should be browned at the edges and may feel a little tougher and should be heated through. If it is read remove it from the oven or wait 5 minutes and check again. Add the baked chicken of the woods to the butter and hot sauce and mix to coat. The mushroom will soften up a little in the sauce. Combine the lemon juice and the rest of the ingredients in a bowl and mix.